Charles de Gaulle airport is dirty gloomy and filled with homeless people in the public areas. Most bathrooms are filthy and the grounds aren't much better. The organization is a complete mess. I'm French and I have a hard time finding my way around it. I can only imagine how foreigners might fare! I cannot believe we pay huge airport fees as part of our tickets for the privilege of struggling in airports like this one. 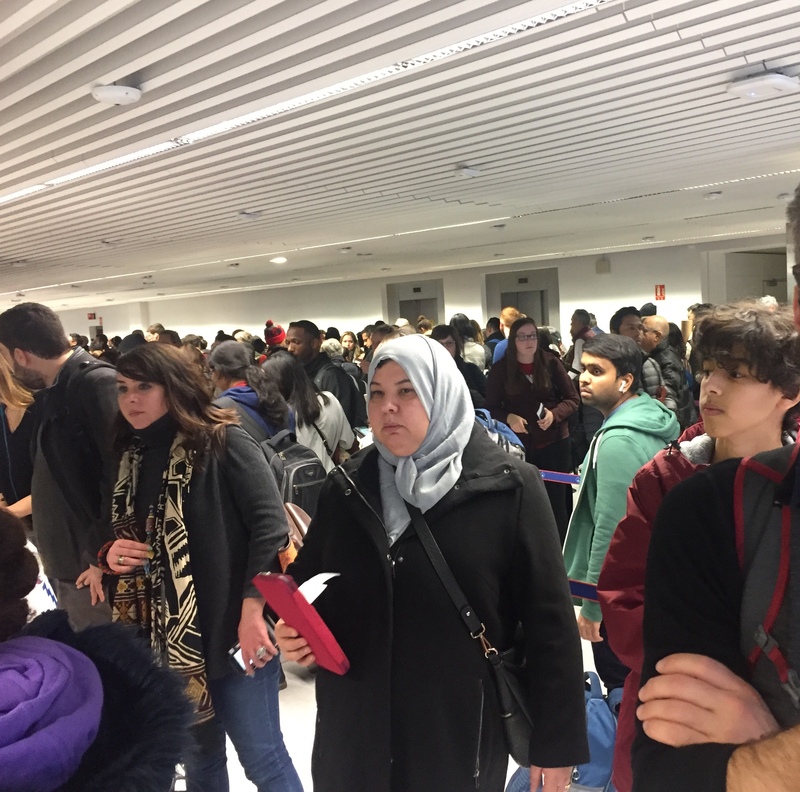 On top of it all try making it through Charles de Gaulle Airport without being held hostage by one of the personnel strikes. They have them pretty much every week which adds chaos to confusion! 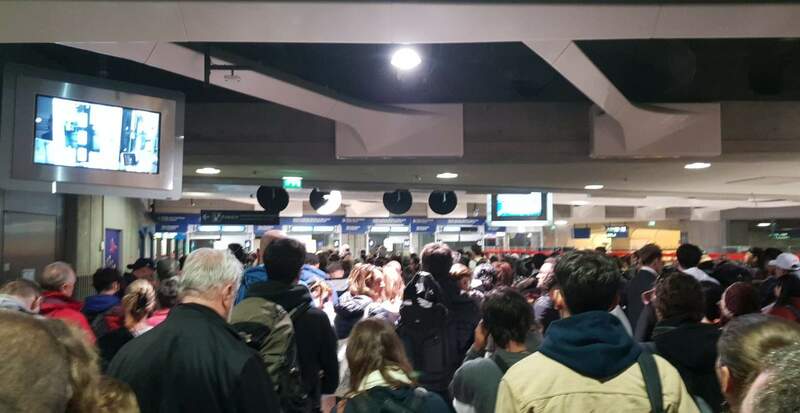 Avoid CDG like the plague London and Amsterdam combined with low-cost European airlines will get you where you need to go even in provincial France under much better conditions. Transferring within Terminal 2 (2D to 2F). The terminal is architecturally interesting but not practical: waiting areas are too small washrooms are small and hard to find departure boards only show flights for the next hour or so which leaves you constantly guessing and signage is poor. I arrived from a transatlantic flight and had a hard time figuring out where to go to make my connection. On the plus side the food is decent and the shopping is OK. There are better airports for European transfers. 21 July arrived early for my evening flight to Dublin as there was strike action by air traffic controllers and I wanted to allow extra time in case of additional crowds. I was pleasantly surprised to note that there was no crowds so used the time to have an excellent meal at airport restaurant. Prices reasonable for an airport restaurant. I was very annoyed to find a lengthy queue for passport control. Only one of the two available booths was operating and when we finally arrived at the booth the official was too busy with his mobile phone to take more than a cursory glance at our passports. So much for security let alone customer service. Paris is a lovely city with much to offer but if leaving is so troublesome it would deter visitors. Terminal 1 at arrival and departure both times a revolting experience. Barely made it to my flight after needing 4.5 hours from Paris Gare du Nord to my departure gate - Schenghen flight. 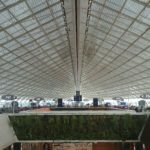 The so-called architecture of this airport is an insult to those passengers that have to use this disgrace of a labyrinth that should be demolished and rebuilt from scratch. The tiny and crowded walkways the redundant direction displays contradicting each other the feeling of being buried alive in a nuclear shelter even the lack of shops! Staff was outrageous at best witnessed several members of check-in the staff snapping at confused Asian tourists. Once you get through the security controls be ready to stand in line for up to 20 minutes for a bottle of overpriced water at the single bar. Need to use the restroom? Too bad there's a flight boarding in front of it- the gate has been strategically located right between the exit of the security controls and the beginning of the queue with only a few dozens of chairs available. I will never use this airport again. 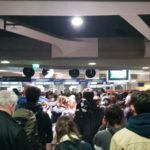 The staff were unfriendly and unhelpful pushing everyone out of the way with a queue barrier and I was also pushed into the crowd by the woman moving a security computer. The airport looks outdated and the staff are unfriendly - I was shouted at by a cleaner in the toilet and had to use the mens. We were not called for our flight and there is nothing to do or see in the airport and we only realised the flight was leaving when everyone was boarding as we hadn't been called. Booarding was a free for all with no effective system. The place is an homage to aesthetic design but does not work in practice. Everywhere takes an age to get to. Getting from outlying lounges to the railway station is a nightmare. The food range is terrible and pokey subterranean cafes close by the departure gates are laughable serving a poor range and poor standard of food at ridiculous prices. French cuisine - you should hang your head in shame. Customer friendly - no. The place is too warm especially in the summer months. If you have less than 1hour 30 minutes to get from one plane to another you have no chance with immigration / security. Even if you make your plane chances are your luggage will not. I flew from Chicago to Tel Aviv via Paris. Since Air France was having problems at O'hare the flight was delayed and I missed the connecting flight to Tel Aviv. 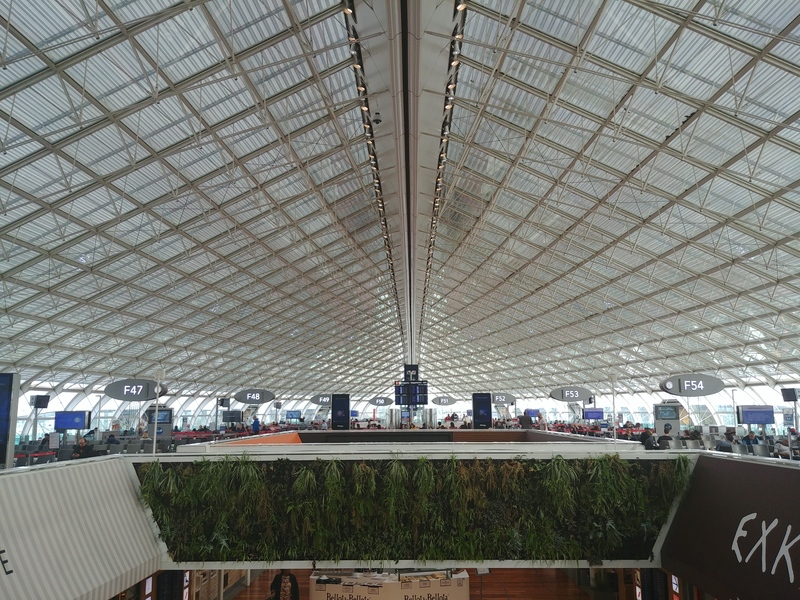 I had to pass seven hours at CDG Airport but found it to be clean and employees very friendly. I was given a free card to call my family in Israel to tell them I was coming on the next flight as well as a voucher for food. I wasn't happy about having missed my connection but this wasn't the airport's fault. On my way back to Chicago I had very little time to make my connection and the line at the security checkpoint was long but it went pretty fast. What irked me a little bit was that just before entering the plane my bags were turned inside out and checked again - this after I had just gone through security. What could I have possibly accrued during the several minutes between here and there? Definitely the worst European airport I have come through. Signposting is fine everything else is terrible. It's incredible that they board a number of intercontinental flights out of 2A-D which is the worst part of terminal two - no A/C not enough seats hundreds of people have to queue where all other pax need to pass to find their gates etc. 2E+F are a little cleaner more modern and slightly more comfortable. 2G is a joke they should call it terminal 4 since it has nothing to do with the terminal 2 building. Security procedures are slow. It's a kind of lottery how much time it will cost and if the airport staff is able to communicate in English. Meanwhile it's guaranteed that nobody will assist you in a friendly manner - except for some airline staff if you're lucky. Shopping and food is very poor in any concourse. Terminal 2D is obsolete flows are confused (arrival and departure passengers flows mix in the terminal) no air conditioning and it was very hot on the end of May pity the poor passengers that will fly in July. Not enough room not enough toilets safety check is long very few eating possibilities in the terminal and the waiting rooms (after safety) are crowded with no shops not enough seating. The ceilings are low building is not clean at all. Boarding bone by Bus. When we came in we had to wait for more than 30 minutes to get our baggage. Flew from 2E also it is slightly better. The worst airport I've seen. We used Terminal I. Never ending queues. It took us more than two hours to check-in. Afterwards we were such in a hurry that my daughter left her shoulder bag and a mobile phone before the passport control. We were asking for help of the airport staff to get it back. Nobody did anything to help us. Neither we were allowed to leave the security- check area and go and pick up the bag. Although we finally spent a while at the security check (another experience I just don't want to remember). One of the CDG emploees told us to forget about the bag and there was no chance we get it back. Have never seen such unfriendly attitude. It's a pity this is the only way for us to get to Paris.